I was a little offended at first. Not on the behalf of Amerindians, either. I have four years of Aboriginal Studies and most of a History degree under my belt, so you’d think I’d be a major supporter of getting rid of racist logos. But, walking into the “Racist Stereotypes and Cultural Appropriation in American Sports” symposium (whew!) , I wasn’t totally convinced. All I could think to do was play devil’s advocate. You see, I’m a sports fan. I was preoccupied with other issues, too. I was wondering what and where the “other side” was. I remembered the time my own high school removed its offensive Indian Head mascot (I was a 10th grader, a history student, but also a cheerleader. There were mixed feelings.). An audience member even suggested that “these guys” (ie. sports fans) were “ignorant” and just sat around watching sports with their “beer bellies.” Are-you-kidding-me? To my defensive mind, the dialogue felt like this: Sports fans support racism. Sports fans spit on and yell at protesters. Sports fans send death threats to well-meaning decision makers who fight for Native peoples. College-aged sports fans get drunk and disrespect a culture to an unforgivable level. Sports fans just don’t get it, do they? Then I remembered first year Native Studies. I remembered a First Nations presenter who discussed patience, listening, giving yourself time to think, letting others speak first. I deleted the tweet. I just listened. I noticed how people were so sensitive about depictions of “Indians.” And, I realized, they should be. These people are rebuilding. We are looking at cultural genocide victims, after all. We have an obligation to listen to them and portray them respectfully because it’s the right thing to do. I heard pain in peoples’ voices as they recounted personal experiences. The father, whose confused little boy asked “Isn’t that what we do at Pow Wow? Are they making fun of us?” in response to people “cheering” at a sports game. Those who were harassed relentlessly when they raised the fact that they were personally offended. People should be allowed to ask for mutual respect from powerful institutions like schools, leagues, and sponsors without fear or risk of cultural deprecation. I heard the word “Ownership.” That one really made me think. I noticed that how much intense and brave work people are doing every day to work towards a better understanding, of not only Aboriginal history but contemporary identity. No doubt, we need to support that. And so, I asked myself, what do DC Football Fans have to lose? Their identity. Their collective memory of the team. Their traditional clothing (see also: hats and jerseys). Their symbolism. Their rituals. Well, gee, doesn’t that sound familiar? I’d think sports fans, of all people, should be able relate to how deeply symbols can manifest in our lives. How important a team is to a community. How important it is to let that team be inclusive and, you know, not racist. Personally, my teams are a part of my identity. I really, really don’t want my identity to be rooted in something that hurts people. I don’t want to be cheering with something that isolates or demeans someone else. Sports are fun, and I want them to be fun for everyone. We all should be open to listening and to changing a name, or a symbol. Teams in and of themselves aren’t about their names. Oh, fans, you must feel that. If the DC Football team had a new name, all that would really change is the t-shirt you have in your closet, or the hat that you wear, or the specific word you yell out. If you define your team spirit or identity by those things, then you need to reassess your fandom. Surely, there’s more to your loyalty than that. And surely, you want your Native brothers and sisters to be able to cheer alongside you without feeling uncomfortable or disrespected. I’ve always been of the opinion that if something means a LOT to someone else, and your concerns are trivial, you should give at least an inch. Your concerns may not feel trivial, because you’re attached to a team. You have something to lose, sorta. But think of how much Natives have to lose. And had to lose. And did lose. I think we owe them respect. And that respect starts here. Consider this your official invitation to be part of the solution. Previous postWhy Technical Difficulties are Secretly Awesome. I’m not a sports fan, so I don’t really understand someone attaching their personal identity to a game or team.This was well-written and thought-provoking, though and worth thinking about in regards to other areas of culture and media. Hmm. Well said but the matter is of more than simply giving in to changing symbols for the sake of the offended. At some point the offended should just go with the flow. Half the problems with this world today is we are changing symbols, names, systems all for those who are offended or might become offended. Case in point, I attended a university where for years the mascot was an Indian Chief. To me and fellow students (many I would say) thought respectfully of the Indians. There never were racial epitaphs or slang used–not in my earshot. But, what did they do? Around the 1990’s some group of Indians complained at the name. The university, in their cultural awareness, changed the name from the Chief to a bird. I guess the bird fans are not as plenteous as Indian fans so the birds won the nomination and the Indians left happy I guess. Lawsuit averted. The lawsuit was averted but from my perspective we all lost. We lost the ability to stand up for Indian culture; to show Indians our respect. We gave in and perhaps lost an opportunity not available since. It’s sad, really. Perhaps those who are offended about such matters need to rethink things. If racism is present, then I say it needs to be addressed and removed. But when a team has a name of a group perhaps honor could be attributed rather than threats of a lawsuit and/or slurs. Just my thoughts; no offense intended to any group. God bless! Thanks so much for the well thought out response. I think we have to divide this issue out a bit, don’t you? 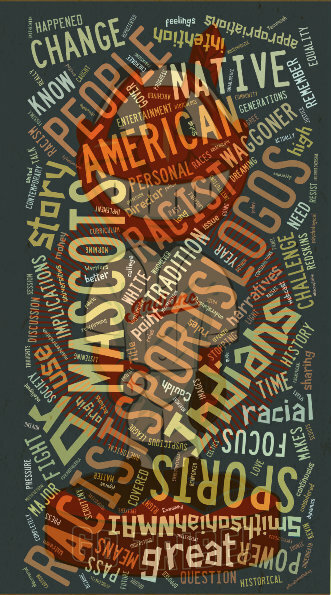 For example, there’s a big difference between the racial connotations of the word “Redskins” and the word “Warriors.” I, too, went to a school which underwent a logo change and had mixed feelings about it (as I mention). In my case, the change happened because the Aboriginal community (who originally supported the mascot) felt that the way it was used was eventually perverted by the way people were cheering, the way we used our mascot’s headdress, etc. Looking back now, I know that I don’t have any right to tell them that they are wrong to be offended. They are in such a tough cultural place right now. It’s not unreasonable to have certain depictions removed–if, of course, the community being depicted requests it. I agree with showing them respect, but I don’t think we get to decide how we show that respect. Certainly, it’s our job to listen and learn and be respectful by their means…not ours. And if the community we’re trying to “respect” says “Actually, that’s hurting us,” then I am personally apt to at least listen, as I’m sure you would be. Personally, I show my respect by taking Aboriginal studies classes, visiting museums/events put in place by aboriginal peoples themselves, reading books written by native writers…basically, by LISTENING. When I listened at the symposium, I heard that people felt personally culturally threatened by sports teams’ depictions of their race. It’s certainly not my place to argue with how anyone feels–in fact, a lot of the harms done by colonization have been the result of the Powerful folks putting words in mouths of people who we perceive as having less power or value (traditionally, the Natives were in that category). Yes, we seem to be of the same mind. Thanks for writing such an intriguing blog. This was so well expressed and showed an understanding of the sense of identity and loss from both viewpoints. I especially appreciate your call to listen — much needed in a culture where the “winner” is increasingly the one most loudly expressing their opinion. Thank you for sharing the quote “Ouch means ouch” as a good reminder to listen without devaluing someone’s feelings.